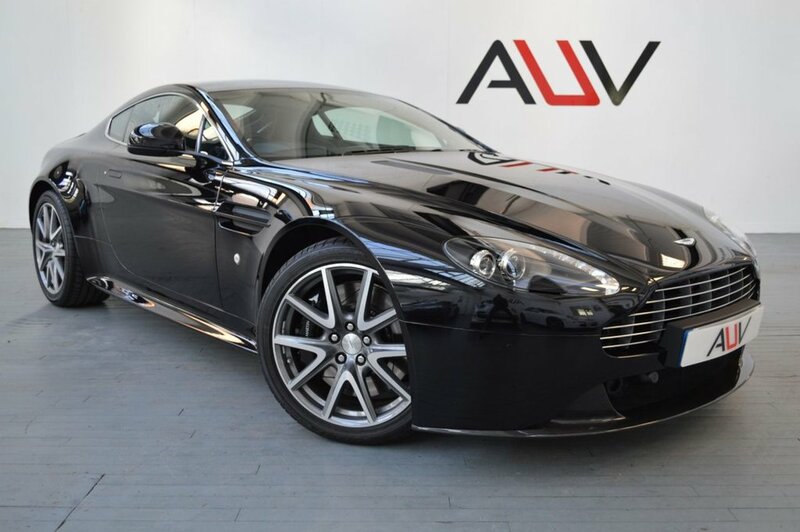 Black, A very low mileage example Aston Martin Vantage with 6 CD autochanger, Bluetooth Telephone preparation, Cruise control, Hill hold assist, Immobiliser, iPod connection, LED map reading lights, Organic electroluminescent (OEL) displays, Rear parking sensor, Remote central locking + boot release, Servotronic speed sensitive power steering, Tracking device, Trip computer, USB connection, Anti-lock Brake System + Electronic Brakeforce Distribution + Emergency Brake Assit, DSC-Dynamic Stability Control, Dual stage Driver/Passenger Airbags, Traction control, Tyre pressure monitoring system, Automatic temperature control system, Rake/reach adjustable steering wheel, Sports steering wheel, Body coloured bumpers, Electric folding mirrors, Electric front windows, Heated door mirrors, Heated rear windscreen, LED rear lamps Before you reserve a vehicle we ask that you read both our Business and Warranty conditions in the 'Terms' tab above. Specialists in vehicle financing we can offer our clients market leading, bespoke funding packages. Finance examples are subject to status, regulated and monitored by the FCA. Goods and services are supplied by Approved Used Vehicles Ltd. For further information on how to reserve this vehicle or tailor your finance package please call us on 01455 446505.